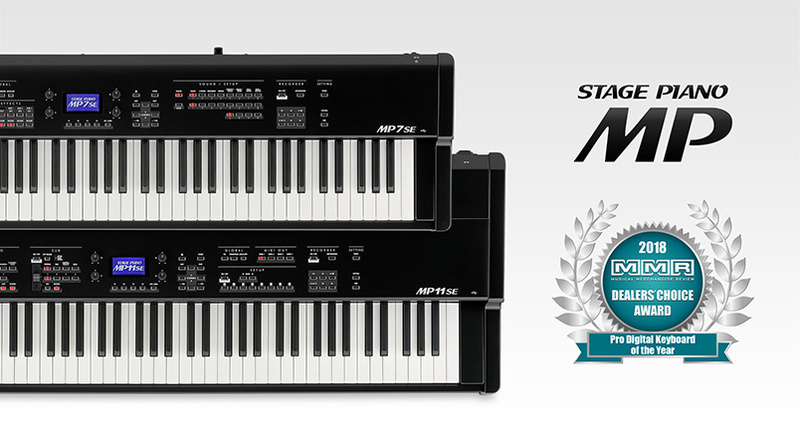 Kawai MP Series wins MMR magazine ‘Dealers’ Choice’ Award | News | Kawai Musical Instruments Manufacturing Co., Ltd.
Musical Merchandise Review (MMR) magazine has announced the results of its 2018 ‘Dealer’s Choice Awards’, naming Kawai’s MP Series stage pianos as ‘Pro Digital Keyboard Line of the Year’. Each year the magazine surveys musical instrument retailers across North America, inviting dealers to vote for their favourite products in a range of categories. Winners in each category receive the celebrated ‘Dealer’s Choice Award’ from MMR, along with the satisfaction of being honoured as one of the musical instrument industry’s finest brands and products. The latest MP11SE and MP7SE professional stage pianos were introduced in late 2017, and combine Kawai’s leading wooden-key and plastic-key keyboard actions with expressive Harmonic Imaging XL sound technology, bringing grand piano authenticity to the studio and stage. In addition to stunning Shigeru Kawai SK-EX, SK-5, and Kawai EX acoustic piano sounds, the MP models also incorporate a selection of realistic electric piano voices, complete with realistic effects and vintage amp/speaker simulations. Designed for the live performer, MP instruments provide superb real-time control over splits, layers, and complex sound adjustments, with comprehensive MIDI controller functionality to manage external devices. Housed within sturdy wood and metal chassis, with grand piano-like ebony polish side arms, the MP11SE and MP7SE are ideally suited to professional musicians who do not accept compromise. The ‘Dealer Choice Awards’ were established in 1992, and have gained a reputation as one of the musical instrument industries foremost accolades. During this time, Kawai’s RX Series grand and K-3 upright pianos have proved a dominant force, winning their respective categories for several consecutive years, while the CA, CN, and MP Series digital lines have also received multiple awards. This year’s success increases Kawai’s tally of MMR trophies to a total of 20, and reflects the company’s long-standing popularity among retailers and customers.